SUPER CHARMING - Hawaiian Vintage styled Cottage..Close to beaches and natural pool. PLEASE NOTE: We have a 3 night minimum but will take 2 night rentals when there is a 2 night opening in the calendar book ended by reserved dates. Send us a message and we will reply. Hana is commonly known as the “Last Hawaiian Place.” Step back into the charm and casual elegance of old Hawai’i in an authentic, meticulously renovated plantation owners home in Hana. Once used to house managers from the sugar cane plantation days, this 1900 home, named Hale Ulu Lulu, underwent a major rebuilding (completed in early 2005 and constantly maintained) and is now completely restored with attention to historic detail, while providing every modern convenience. We have designed an open and airy layout with spectacular ocean and pastoral views from every room. Your eyes will delight on the beautiful Brazilian Mahogany floors, elegantly detailed, vintage style bath with dual-sided claw foot tub (great for romantic baths for two), granite kitchen counters with reclaimed Koa wood bar/counter and trim accents. A sliding panel of framed Tapa cloth between the bedroom and living area allows you to relax in bed to the incredible view or, when closed, to have complete privacy from the rest of the house. The furnishings are classic and comfortable with a Missionary antique and Asian influence. We have designed the cottage with warm tropical colors, original local artwork, Hawaiian antiques and Polynesian exotica. Though the house has a tasteful and elegant décor, you can still put your feet on the furniture and enjoy the relaxed atmosphere. You will arrive to rooms filled with brilliant tropical flowers and orchids, 100% cotton, high thread count, quality linens and towels and quality soaps as well as coffee and green tea and fresh fruit to start off your first day with us – fine details on par with the finest luxury hotel at a fraction of comparable prices (really). Hale Ulu Lulu is part of a sprawling two-acre property surrounded by gracious lawns and verdant tropical gardens and foliage. We live on the property and constantly maintain our homes. They are meticulously cared for and we run our business like any fine hotel (sorry, no room service!). Though we usually greet you upon arrival and answer any questions, we leave you completely alone to enjoy your stay. The Guest Houses at Malanai are named after the gentle cooling breeze , (named Malanai) known for this area of Hana. We are located just three miles south of Hana Town in the Maka’alae district, which is considered the most highly desired area of Hana. You are sure to fall in love with the picturesque and pastoral landscape, the ever-changing ocean colors and the gentle sound of the waves lulling you to sleep at night. 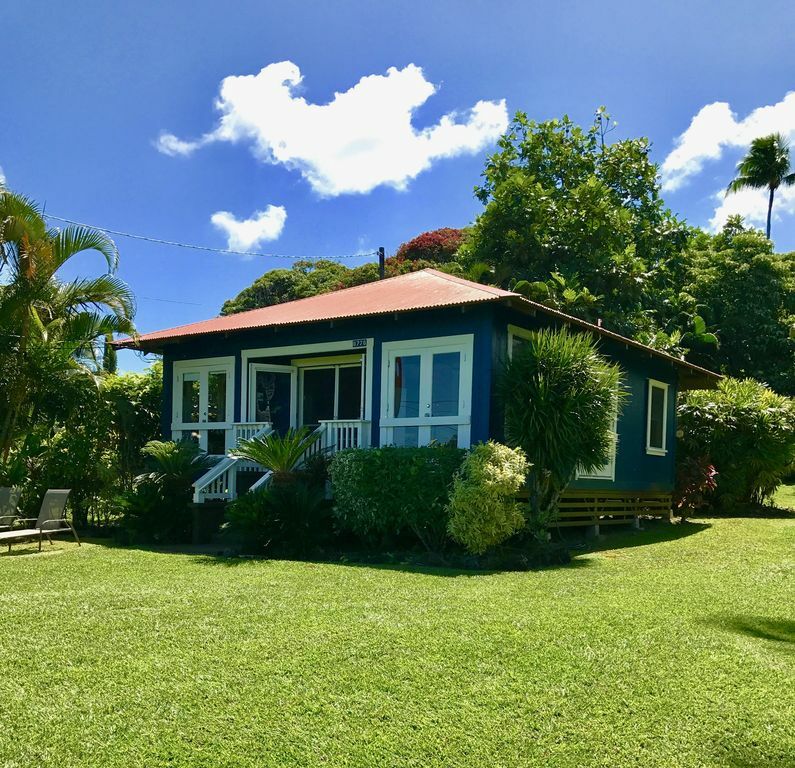 Walk 12 minutes to the world famous Hamoa beach (or a 2 minute drive) or 12 minutes in the other direction to the Venus pool- two of Hana’s most desired attractions – practically in our back yard! Our rates vary depending on the season and number of nights booked. Please click on the "rates" link for a full description of our rates. Mahalo! Haleakala Volcano is the backdrop to our property. We have an amazing ocean view. You can hear the surf crashing against the shore at night. Wireless with an answering machine for your use. We are all about detail and comfort. Towels and linens are all high thread count & pure cotton. Our kitchen is fully and thoughtfully equipped. Please see the inventory on our website for full details. We have a new Vizio TV and offer Netflix and Amazon streaming movies, Hulu TV and Utube and choose not to have standard TV stations, with all the commercials. Such a quiet and relaxing location close to town and beaches, the cottage was well equipped and clean, we would definitely return! This is one of the nicest rentals we have stayed in. Perfect for a couple looking for a retreat from the business of much of the rest of Maui. Lovely designer touches and colors, very soothing to the spirit. Close access to Hana town if you wish, and not far to Haleakala National Park for hiking up the pools trail. Note that it can be muddy after the rains on the trails, but spectacular. A truly beautiful home decorated with fresh flowers. Great location, a perfect base from which to explore and enjoy Hāna. We are always so glad to know that our guests had a great time on their stay at the Hana Guest Houses. Thank you for your review! We had a wonderful stay and will be back. Great location, charming house and just right for the two of us. We loved our stay at this rental. Everything was as described. It was so beautiful and comfortable. We stayed for 2 nights and wished we had made it longer. I highly recommend this place!! Thank you for the great review! We appreciate you taking the time to help keep our business thriving. Please do come back again and stay longer if you can. We are committed to you having exactly the vacation you have dreamed of, We will direct you to the activities in Hana, These include: Hiking (especially the famous bamboo forest at Haleakala National Park - 20 minutes down the road), in house massage and more, We will share our knowledge of Hana with you- where to find the secret spots, where not to go and where to buy local fresh fish when available! Hale Ulu Lulu sleeps 1-2 guests only. (No exceptions) The nightly rate varies depending on high or low season. There is a taxable cleaning fee on one and two night stays of $50. No cleaning fees on stays of 3 nights or more. HIGH SEASON December 18 thru April 18 High Season (1-2 guests) 3 nights or more $325 plus tax per night High Season (1-2 guests) 1-2 nights $345 plus tax per night High Season (1-2 guests) weekly $300 plus tax per night LOW SEASON April 19 thru December 17 Low Season (1-2 guests) 3 nights or more $300 plus tax per night Low Season (1-2 guests) 1-2 nights $325 plus tax per night Low Season (1-2 guests) weekly $285 plus tax per night If you have any questions regarding our rate, please email us and we can assist you! Mahalo!